There are many different types of plasmids backbones and parts that compose plasmid backbones in the Registry. Here we've tried to collect all the plasmid backbones and plasmid parts into one place for easy browsing and retrieval. Help: Have questions about plasmid backbones? Want to know how to enter new plasmid backbones into the Registry, how to build new BioBrick® plasmid backbones, or how to name new BioBrick® plasmid backbones? See the help pages for more information. Looking for information about the Linearized Plasmid Backbones provided by the Registry? See the linearized plasmid backbones Help page. The most common reasons to use BioBrick plasmid backbones is (1) to assemble two BioBrick® parts together and (2) to characterize and run BioBrick® parts, devices and systems. Assembly: Are you trying to assemble two BioBrick parts together? There are a set of plasmid backbones available designed to make assembly of BioBrick parts easier. System operation: Oftentimes, it pays to use a different set of plasmid backbones for operating or running your BioBrick® device or system than you use for assembly. For example, some BioBrick devices and systems consume too many resources when operated on a high copy plasmid backbone and significantly impact cell growth. In those cases, you might want to switch to a low or medium copy plasmid backbone. Experienced users of the Registry might be interested in assembling protein domains, measuring the behavior of BioBrick parts and devices, constructing parts and devices, screening part libraries, or constructing new BioBrick plasmids. You can find plasmid backbones especially designed for each of these purposes here. Expression plasmids: Are you trying to quickly express a single recombinant protein? Here are some BioBrick expression parts designed to help you do just that. Assembly of protein fusions: Are you trying to do an in-frame assembly of two protein domains? There are a set of plasmid backbones available designed to make assembly of protein domains easier. Measurement: Are you interested in measuring the behavior of a BioBrick promoter, ribosome binding site, or transcriptional inverter? Jason Kelly has designed various plasmid backbones to streamline the process of part characterization so that you can compare your results to those that others have gotten. Screening libraries of parts: Interested in designing a randomized library of a type of BioBrick part and screening the library for functional parts? There are a set of plasmid backbones available specifically designed for screening libraries of promoters, coding sequences, and RBS.coding sequences. Building new BioBrick vectors: Sometimes there just isn't a plasmid backbone already available that has the replication origin and antibiotic resistance marker that you want. In that case, you might need to build a new BioBrick plasmid backbone. But you don't need to start from scratch. Here are a set of BioBrick parts that might help you in building a new BioBrick plasmid backbone. Commercial gene synthesis: Most DNA synthesis companies do not currently use BioBrick plasmid backbones to clone synthesized BioBrick parts. Therefore, some parts in the Registry are available in non-standard plasmid backbones because they were constructed via direct DNA synthesis. Here is a list of plasmid backbones used by assorted DNA synthesis companies. Other assembly standard plasmid backbones: Some Registry contributors have built plasmid backbones that comply with other assembly standards, such as the Berkeley standard or the Lim lab standard. Check out those plasmid backbones here. Note: These parts are legacy parts. They are included for completeness only and should not be used as a template to create new parts. There are additional, miscellaneous plasmid backbones available via the Registry. 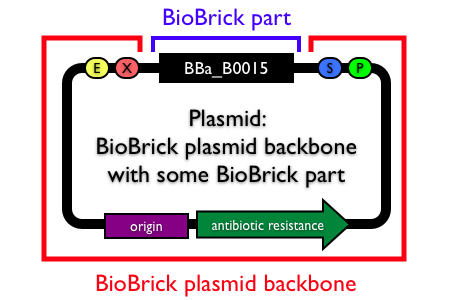 BioBrick friendly plasmid backbones: Some Registry contributors have built plasmids that don't strictly comply with the BioBrick assembly standard, but still can accept BioBrick parts. Therefore, they might be useful to you. Check out those plasmids here. Archive: Older plasmid backbones that have been replaced by new versions of BioBrick plasmid backbones.